Well, friends, the day has arrived. Today, May 19, 2017, marks the release of my first book into the wild. 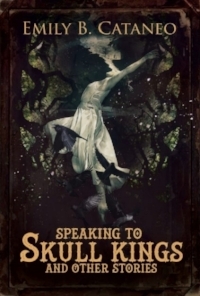 Yes, it's true: Speaking to Skull Kings and Other Stories is now officially for sale at JournalStone and Amazon. That means that if you ordered an ebook, it should be on your e-reader right now, and if you ordered a paper copy, it should be on its way to you as we speak. I want to give a shoutout to Jess Landry over at JournalStone for inviting me to send her a collection so many months ago, and for all of her invaluable comments and insights during the editorial process. There are many, many other people to thank, and you shall see them in my book acknowledgements (which, as my husband says, are long enough to be a story unto themselves) but I want to extend a general thank you to everyone who is reading this and everyone who has ordered or is planning to order the book. I hope you enjoy it! Don't forget to head on over to Amazon and/or Goodreads to tell the world what you thought of it! Also, if you're like, who is this Emily, and why is she always going on about matters both eldritch and writerly, well, check out the interview I did with Hellnotes earlier this month (in which I talk about feminism, journalism, and witches) and the interview I did with Simon Bestwick's The Lowdown last week (about my favorite piece of published writing and Berlin and a haunted healing spa in the Mojave desert). Also, if you are a New England personage, don't forget that I'm doing a book reading/Q&A/signing at Trident Booksellers on Newbury Street on June 20. Tell all your friends! And come on by and ask me anything! I will also be at WisCon next week (more details on that forthcoming) appearing on panels, reading from the book, and perhaps having an impromptu book release party, so, if you are a Midwest personage, I hope to see you there! I'm excited to announce that my short story "The Emerald Coat and Other Wishes" will appear in the spring 2015 issue of Interfictions Online: A Journal of Interstitial Arts. Interfictions and the Interstitial Arts Foundation promote exactly the sort of art and literature that I'm interested in: unclassifiable work that straddles boundaries. Besides, Interfictions produced several great anthologies and now publishes fabulous authors in its online magazine, so I'm quite excited to contribute to it. I found the inspiration for this story over the summer while reading about the dark side of Victorian fashion: garments that poisoned their owners because they were treated or manufactured with arsenic or other poisons. The result is a tale about museums, London, death, World War I, family curses, immortality, and, of course, the dark side of Victorian fashion. You know. The usual. I'm quite happy to announce that my short story "Not the Grand Duke's Dancer" will appear in issue #5 of The Dark, an online magazine of dark and strange fiction. This is my first Odyssey story to find a home-- the story began its life as a much shorter piece that I read at the Odyssey Science Fiction and Fantasy Slam. This is a tradition at the workshop where halfway through the hectic six weeks of writing and critiquing, Odyssey students take a break to road trip from Manchester, N.H. to a Barnes and Noble in Nashua, N.H., where they read flash fiction pieces. This was one of my first experiences reading my writing out loud, and while it was nerve-wracking (my parents were there! ), I do think it's an essential skill for any writer to develop. At any rate, when I returned home from the workshop, I expanded the piece to its current form, and here we are. Mariinsky Theater in St. Petersburg, an important setting in the story. Also pictured: 18-year-old me, imagination whirring, no doubt. Hot air balloons rising over Stockholm. This image has always stuck with me--I took this picture on a lazy summer evening, at about 9 p.m., because it stays light quite late in Scandinavia in the summer. I was sitting with one of my best friends by the water, eating violet ice cream. I'm glad I was able to insert such a happy memory into a story. 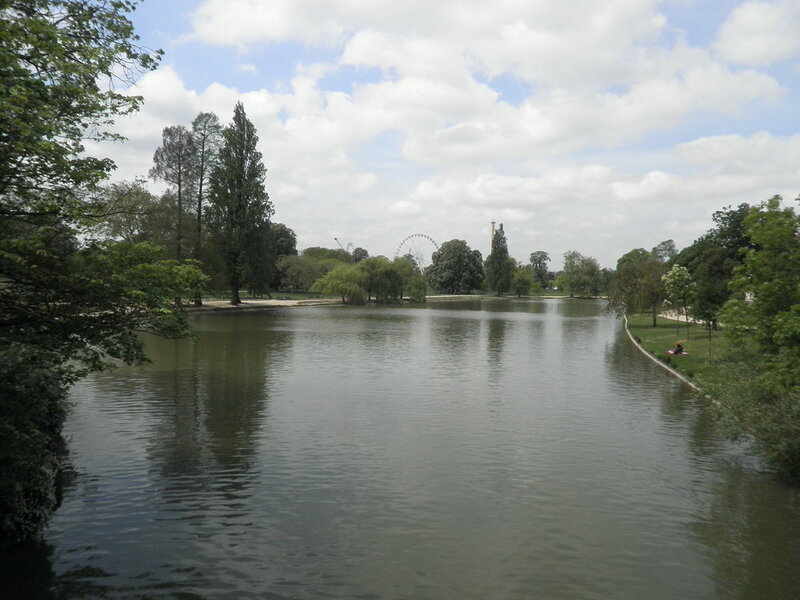 A view of Munich. One pivotal scene in this story takes place in a cursed church in Munich, which I based on the Frauenkirche, the church on the left in this picture, which has several interesting legends attached to it. Highgate Cemetery in London, which I visited when I was studying abroad in London, because I do love visiting cemeteries (to no one's surprise). Karl Marx is buried here, and many people believe it inspired several scenes in Bram Stoker's Dracula. Of course, this story isn't all fun and games and frolicking through Europe on a magical tour. I also drew on negative and bittersweet experiences--especially those involving relationships-- to write this story. Which just goes to show you that the old cliche is true: no experience is ever wasted for a writer. Anyway, I'm pleased this story found a home, and I hope you enjoy it when it comes out in August. A year ago today, I was sitting at my desk in my old office, obsessively checking my email as the work day wound down. I had applied early decision to the Odyssey Writing Workshop, and according to the website, on Feb. 28 I'd find out whether my application had been accepted early or held over for the regular decision period in April. How would I find out, I wondered? A phone call? An email? A letter waiting for me in my mailbox when I returned to my apartment that night? AN OWL?! At last, at nearly 5 p.m., my stomach roiling, I clicked over to my Gmail tab and saw I had three emails. From Odyssey leader Jeanne Cavelos. I had gotten in. I had gotten in! I raced out to the office parking lot to call my dad and tell him the good news, and for the first time in my post-college young professional life, I found myself crying tears of joy in my office parking lot. Now, a year later, I can say with confidence that leaving my job, my apartment, and my life in Boston for the summer to attend Odyssey was one of the best decisions--if not the best decision--I've ever made. Here's how Odyssey works: you spend six weeks living at St. Anselm College in Manchester, N.H., taking classes, writing, and critiquing your classmates' work. At Odyssey, I learned more about writing than I ever thought possible. I met wonderful guest authors. I made friends who I still critique with, rant about rejection letters to, go to for writing advice. At Odyssey, I barely slept or worked out or ate anything but bacon and kettle corn for six weeks, but it was all worth it. Thanks to Odyssey, I have the tools I need to become the writer I want to become. Yes, there's still a long road ahead, but if it weren't for Odyssey, I wouldn't even be on that road. So if you're at all serious about writing, you should apply to Odyssey. You can find all the information here. The early application deadline has already passed, but regular applications aren't due until April 8. I realize that not everyone is 24 years old and has the flexibility to pick up and leave for the summer, but if you are in a place in your life where you can, do it. I promise you will not be disappointed. Besides writing and reading, traveling is probably the most important activity for my writing career. Anyone who knows me knows I love to travel--I'm always packing up my ridiculously oversized hiking backpack for a weekend trip to a different city in the Northeast or for some European extravaganza. But although I love to travel, I don't equate it with going on vacation: for me, traveling is part of my work, an opportunity to overload my senses with new places, buildings, natural vistas, people, food, etc., then go back to my hotel/hostel/friend's couch at the end of the day and scribble new story ideas and observations in my notebook until I collapse into sleep. I think some people view traveling as a frivolous activity, but for me, it's an integral part of my writing process. I'm a visual, setting-oriented writer, and I don't think I would have written 90 percent of the fiction words I've written if I hadn't invested so much time and money in traveling over the years. On that note, I visited Philadelphia for the first time last weekend, to spend time with my dear friend Laura who moved there for graduate school and to see the city. While there, I visited two museums: the University of Pennsylvania Museum of Archaeology and Anthropology and the Mutter Museum. At the UPenn Museum, my friend and fellow Odfellow Brad Hafford showed me around the collections. I learned about the culture of ancient Ur and about Ur's tombs, such as the "great death pit" where archaeologists found dozens of bodies of people who may or may not have committed suicide so they could journey to the after life with their queen. Naturally, these tombs, combined with the culture's overall aesthetic (limestone statues, ram's heads on the arms of throne chairs, make-up pigment stored in shells, lapis and carnelian cloak-pins) gave me an idea for a story called Girl Guards of the Afterlife, which I will be working on this week. The next day it was off to the Mutter Museum, the famous museum of medical oddities that I had been waiting forever to attend. This 19-century-style museum features cramped shelves and rooms full of objects of the macabre, creepy and just plain gross variety. I saw a liver that had been mutilated by a corset; the body of the Soap Lady, a woman whose body turned entirely to soap after she died; the largest skeleton on display in North America; dozens and dozens of white polished inner ears displayed in tiny bell jars; and, perhaps the most macabre part, fetuses with birth defects, all floating in glass jars and displayed in one corner of the museum's downstairs room. -Prague, age 19, suicide by potassium cyanide because of unfaithfulness of his mistress. -Famous criminal, guilty of many atrocities, captured with his band of 10 and hanged in a castle. 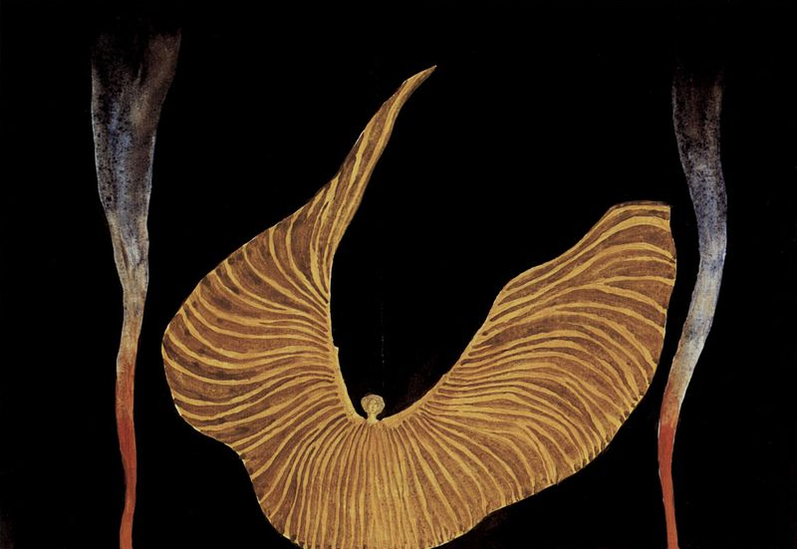 -Ravenna, age 20, embroiderer in silk, died of tuberculosis. Needless to say, I came up with some story ideas at the Mutter Museum as well. I spent the rest of the weekend strolling the streets of Philadelphia with my lovely friends. Philadelphia's City Hall has ravens on it! Ravens, I tell you! (They're up around the base of the tower, in case you can't tell from this picture). So yes, this is why I travel: because it invariably piques my imagination and leaves me pondering new story ideas on the bus/train/airplane/car ride home. Of course, it's not always practical to live the life of a traveler: we all have homes, and responsibilities. But I think it's possible to live as a traveler even in your own city: keen observation, curiosity and a sense of adventure can turn up inspiration in even the most familiar of places.